I had the chance to take a look at ZChillers at NHC this past summer. ZChillers are double tube counter flow wort chillers. 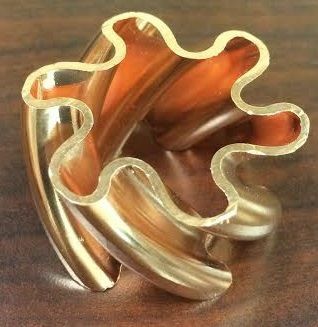 The interior tubing is a Spiral Star Design. This spiraling increases the surface area of copper that’s in contact with your wort. It also increases turbulence. More movement across more surface area means your wort chills quickly. Chilling performance graphs are available on ZChillers Website in the News Section. While you’re there, take a gander at the Testimonials section. Three versions are available starting at $159.99. ZChillers come with your choice of no fittings, 1/2″ NPT and Male Garden Hose Fittings. Here is a look at a cross section of the same style as used in ZChillers. You can see the Spiral Star Design. Standard ZChiller – 9″ diameter, 3.5″ tall, made from 102″ of copper tubing. Our original design created with small-batch homebrewers in mind. Compact, efficient, and recommended for batches of 7.5 gallons or less. Square ZChiller – 8.75″ side length, 7.25″ tall, made from 134″ of copper tubing. Distinctive design delivers cooling rates comparable to the Large ZChiller with a brand new look to spice up your brewing rig. If you’re looking for a unique chiller with a bit of flash that can handle a variety of batch sizes, look no further. This entry was posted in Made in the US, Wort Chillers on November 3, 2014 by admin.